New York vital records began to be registered in 1880. Prior to 1880, some larger cities recorded such statistics and briefly, after 1847, town school districts collected this information. 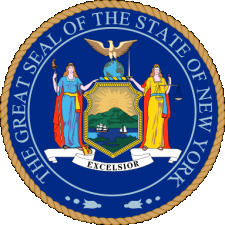 New York birth records can be obtained from the local registrar of the municipality where the event occurred, as can New York death records. The Department of Health does not file and cannot issue copies of New York City birth or death certificates. Births and deaths in any of the five boroughs of New York City can be obtained at the New York City Department of Health and Mental Hygiene (http://www.nyc.gov/html/doh/html/vr/vrbappl.shtml). For a fee, birth and death certificates may be obtained online, by telephone, or by mail--but only by individuals or parents actually listed on the certificate who have valid identification. Others must obtain a court order, have a lawful, documented right of claim, or medical necessity. Note: For New York City information, see the separate entry. Records may be ordered online from website via VitalChek. Record Access Requirements: Must have a notarized release from persons of record or immediate family member for investigative purposes. Record Access Requirements: Current records (50 years or less) are not public information and are only available to the parties involved or their authorization or to legal representatives for litigation purposes. Otherwise, records are open. Search Note: The form may be downloaded form the web page or call to have one mailed. Note: To obtain a copy of a divorce decree prior to 1963, visit the county court where the document was filed. Record Access Requirements: If you are not a party to the divorce you must have a court order to obtain records or show legal cause. Note: The details below primarily refer to criminal court cases. The OCA mandates that all criminal record requests made to county Supreme Court Clerks and City Courts be forwarded to this office for processing. Direct questions to question@courts.state.ny.us. Record Access Requirements: Most counties provide felony case information back to 1981. Notable exceptions are New York (1987), Richmond (1987), and Kings (1987). NYS town and village court criminal disposition data contains approx. 20% of cases since 2003. Search Note: Conviction and "pending" records are reported. Note: Email questions to RecordReview@dcjs.state.ny.us. Records are only released pursuant to court order, subpoena, to entities authorized by statute, or to person of record. The public must search at the county court level and via the state OCA system. Record Access Requirements: One may obtain their own personal criminal history record review by requesting a Record Review Packet from DCJS, and following the directions for the completion and submission of a fingerprint card to DCJS, along with a fee of $50. Note: Written requests should be directed to FOIA Unit. Search Note: Location, DIN number, conviction and sentencing information, and release dates are provided.